EssentialPIM is a personal information manager tool designed to function like Microsoft Outlook sans the whopping price tag. As the name suggests, EssentialPIM, as the name implies, enables users to organize their lives for both business and personal endeavors. Like in Outlook, EssentialPIM users can set up their emails, schedule appointments on their calendars, create and track tasks, take notes and even manage the passwords of separate accounts. It is available as a desktop-based tool and there is also a mobile app for Android and iOS and they both sync together. This allows users to stay on top of their schedules, appointments, and communications whether they’re at the office, on the go, or at home. EssentialPIM helps you organize your life and your work by storing all your information, communication, tasks, and schedule into a single, user-friendly platform that heavily mimics Microsoft Outlook. The similarity with MS Outlook plays to the advantage of EssentialPIM and its users as the software presents them with the familiarity that allows them to quickly get acquainted with the system and fully maximize its capabilities. It has that similar toolbar that runs along the left side that enables you to cycle effortlessly through your notes, to-do lists, contacts, calendars, and on certain occasions, your trash. Entering your details is a breeze as well. Simply fill up the empty fields with the required information and you’re good. And if you are quite experienced with time management software, you won’t find it difficult to set your schedules and create reminders for recurring events among others. EssentialPIM has a drag and drop interface that lets you edit your schedules and drag them to a different without having to re-enter your information. 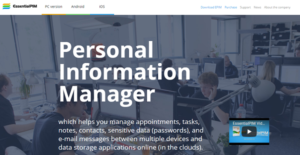 It can’t be argued that there are a number of personal information management programs out there that are effective in managing daily tasks and all. That said, EssentialPIM provides you with a system that really works and one that doesn’t shock you a pricey figure. If you are interested in EssentialPIM it might also be beneficial to investigate other subcategories of Best Product Information Management - PIM collected in our base of SaaS software reviews. It is important to note that almost no app in the Product Information Management - PIM category is going to be a perfect solution that can meet all the needs of different company types, sizes and industries. It may be a good idea to read a few EssentialPIM reviews first as some solutions can dominate just in a really small set of applications or be created with a very specific type of industry in mind. Others can function with an idea of being easy and intuitive and consequently lack complicated elements desired by more experienced users. You can also come across solutions that cater to a wide group of users and offer a rich feature set, but that in most cases comes at a more significant price of such a software. Be certain that you're aware of your requirements so that you choose a service that has exactly the features you search for. How Much Does EssentialPIM Cost? We realize that when you make a decision to buy Product Information Management - PIM it’s important not only to see how experts evaluate it in their reviews, but also to find out if the real people and companies that buy it are actually satisfied with the product. That’s why we’ve created our behavior-based Customer Satisfaction Algorithm™ that gathers customer reviews, comments and EssentialPIM reviews across a wide range of social media sites. The data is then presented in an easy to digest form showing how many people had positive and negative experience with EssentialPIM. With that information at hand you should be equipped to make an informed buying decision that you won’t regret. What are EssentialPIM pricing details? What integrations are available for EssentialPIM? If you need more information about EssentialPIM or you simply have a question let us know what you need and we’ll forward your request directly to the vendor.